2001-06-15 Assigned to KORRY ELECTRONICS, CO. reassignment KORRY ELECTRONICS, CO. ASSIGNMENT OF ASSIGNORS INTEREST (SEE DOCUMENT FOR DETAILS). Assignors: GAN, SHUBANG, HUMPHREY, STEPHEN H., ROBINSON, TIMOTHY R.
2003-09-29 Assigned to WACHOVIA BANK, NATIONAL ASSOCIATION reassignment WACHOVIA BANK, NATIONAL ASSOCIATION SECURITY AGREEMENT Assignors: ADVANCED INPUT DEVICES, INC., ARMTEC COUNTERMAEASURES CO., ARMTEC DEFENSE PRODUCTS CO., BOYAR-SCHULTZ CORPORATION, BVR TECHNOLOGIES CO., ESTERLINE TECHNOLOGIES CORPORATION, EXCELLON AUTOMATION CO., FLUID REGULATORS CORPORATION, KIRKHILL-TA CO., KORRY ELECTRONICS CO., MEMTRON TECHNOLOGIES CO., NORWICH AERO PRODUCTS, INC., PRESSURE SYSTEMS, INC., W.A.WHITNEY CO.
2011-04-12 Assigned to WELLS FARGO BANK, NATIONAL ASSOCIATION, AS ADMINISTRATIVE AGENT reassignment WELLS FARGO BANK, NATIONAL ASSOCIATION, AS ADMINISTRATIVE AGENT SECURITY AGREEMENT Assignors: KORRY ELECTRONICS CO.
2019-03-15 Assigned to PRESSURE SYSTEMS, INC., KORRY ELECTRONICS CO., FLUID REGULATORS CORPORATION, BVR TECHNOLOGIES CO., ARMTEC DEFENSE PRODUCTS CO., KIRKHILL-TA CO., W.A. WHITNEY CO., ARMTEC COUNTERMEASURES CO., ADVANCED INPUT DEVICES, INC., EXCELLON AUTOMATION CO., MEMTRON TECHNOLOGIES CO., NORWICH AERO PRODUCTS, INC., BOYAR-SCHULTZ CORPORATION reassignment PRESSURE SYSTEMS, INC. RELEASE BY SECURED PARTY (SEE DOCUMENT FOR DETAILS). Assignors: WELLS FARGO BANK, NATIONAL ASSOCIATION, AS ADMINISTRATIVE AGENT FOR THE SECURED PARTIES AND SUCCESSOR TO WACHOVIA BANK, N.A. 2019-04-03 Assigned to CREDIT SUISSE AG reassignment CREDIT SUISSE AG SECURITY INTEREST (SEE DOCUMENT FOR DETAILS). Assignors: ADVANCED INPUT DEVICES, INC., ARMTEC COUNTERMEASURES CO., ARMTEC DEFENSE PRODUCTS CO., JOSLYN SUNBANK COMPANY, LLC, KORRY ELECTRONICS CO., LEACH INTERNATIONAL CORPORATION, MASON ELECTRIC CO., MEMTRON TECHNOLOGIES CO., NMC GROUP, INC., PALOMAR PRODUCTS, INC., SOURIAU USA, INC., TA AEROSPACE CO.
2019-04-03 Assigned to THE BANK OF NEW YORK MELLON TRUST COMPANY, N.A. reassignment THE BANK OF NEW YORK MELLON TRUST COMPANY, N.A. SECURITY INTEREST (SEE DOCUMENT FOR DETAILS). Assignors: ADVANCED INPUT DEVICES, INC., ARMTEC COUNTERMEASURES CO., ARMTEC DEFENSE PRODUCTS CO., JOSLYN SUNBANK COMPANY, LLC, KORRY ELECTRONICS CO., LEACH INTERNATIONAL CORPORATION, MASON ELECTRIC CO., MEMTRON TECHNOLOGIES CO., NMC GROUP, INC., PALOMAR PRODUCTS, INC., SOURIAU USA, INC., TA AEROSPACE CO.
A method and a system for fabricating articles made from thermoset resins using an ionic mold release agent. The invention uses a mold having a metal oxide surface with enhanced mold release characteristics. The release agent is applied internally in the resin composition or externally on the metal oxide surface. The method includes providing a mold, forming a metal oxide surface on the mold, providing an ionic release agent, providing the acid or base conjugate of the release agent at the metal oxide surface, providing a thermoset resin in the mold, and curing the resin in the mold. A method of using float glass having a SnO2 enriched surface, wherein the method includes the steps of providing an ionic release agent externally to the tin oxide surface, is also disclosed. This application is a continuation-in-part of U.S. patent application Ser. No. 09/769,014, filed Jan. 19, 2001, now pending. In one actual embodiment of the present invention, a metal oxide coating is deposited on a silica containing glass substrate by chemical or physical vapor deposition methods. The metal oxide is Al 2O3. The release agent is an organic acid phosphate ester, and the resin mixture contains an isocyanate or epoxy. In a second actual embodiment of the present invention, a method of using float glass having SnO 2 on a surface is discolored, the method includes the step of providing an ionic release agent externally to the SnO2 surface, providing a mold formed from float glass and providing a urethane or an epoxy resin in the mold, and curing the resin. The present invention thus provides enhanced release properties for external and internal mold releases having an ionic character leading to less surface defects for many optical plastic consumer articles made by cell casting or reaction injection molding techniques. FIG. 19 shows a graphical representation of the pull force vs. displacement curve for Example 10. FIGS. 1-3 illustrate a method and system for fabricating articles made from thermoset resins using an organic phosphate acid as the mold release agent. The system in the present invention uses a mold having a metal oxide surface which will enhance the release characteristics of an ionic mold release agent. In one actual embodiment, the mold is a glass mold constructed from float glass which has had a thin metal oxide coating formed on the inner face mold surface. Preferably, the metal oxide is deposited onto the “air-side” of the float glass substrate for highest durability. The thin metal oxide coating can be applied in any number of methods known in the thin metal coating art, such as physical vapor deposition (PVD) and chemical vapor deposition (CVD), including vacuum deposition and sputter deposition. The thin metal oxide coating can have a thickness of about 1 nm to about 10000 nm, preferably the thickness is in the range of about 50 to about 2000 nm, and 100-500 nm is most preferred. FIG. 1 shows a schematic representation of a suitable method and apparatus for forming a thin metal oxide coating on a substrate. While a thin metal oxide coating formed on a glass substrate is preferred, other alternates of the present invention can have the mold constructed from a metal substrate. In this manner, the metal substrate can form the metal oxide coating upon exposure to air. A representative example of an apparatus for forming the thin metal coating includes a chamber 100 having a substrate holder 102 for holding the mold substrate 104 in a preferred orientation while it is coated with a preferred compound. The chamber 100 includes an outlet 114 to a vacuum pump to evacuate the chamber 100 of air. The chamber 100 also includes an ion gun 110 with gas inlet 112. The ion gun can be augmented or replaced by an internal heating system. The substrate is heated to enhance the metal oxide film density and durability. An electron beam source 108 evaporates the compound 106 that is to be deposited onto the substrate 104. Referring now to FIG. 2, a schematic representation of providing a mold release agent to a member of a mold is illustrated. In one actual embodiment of an applicator apparatus  128, a container 122 is provided for holding a quantity of a suitable mold release agent 124. The release agent 124 can be applied externally on the metal oxide surface 120 by “dipping” (represented by arrow 126) the mold member 104 with metal oxide surface 120 in the container 122 holding the mold release agent 124. Alternatively, the agent can be applied with an applicator, such as a brush or a wipe, or in any of a number of manual application techniques. The aforementioned techniques will be referred to generally as being external methods of application. Alternatively, in another actual embodiment, the mold release agent can be applied in the resin composition mixture as an internal mold release. In this manner, the release agent is mixed with the resin composition and will migrate to the metal oxide surface of the mold member, thereby forming a barrier between the mold surface and the uncured resin composition. According to the present invention, a desirable mold release agent interacts with the metal oxide surface to advantageously enhance the releasing qualities of the agent. Referring now to FIG. 3, the treated mold surfaces can be rinsed with a washer apparatus  118 to remove any excess mold release agent. The washer includes a spray bar 130, which produces water sprays 132 through nozzles. The sprays 132 rinse excess release agent from the mold member 104 and metal oxide surface 120. Alternatively, the mold surfaces can be wiped with a manual wipe, such as an absorbent fabric. While removing any excess mold release is generally preferred, the step is optional. According to the present invention, suitable molds include those used in cell casting and reaction injection molding (RIM). In cell casting, a mold can be constructed from any number of members having one or a plurality of facing surfaces. A “face”, “facing”, or “inner” surface will be used to denote that side of a mold which will contact the resin composition. The number of members is determined by the desired finished product. For example, a flat cell cast sheet would require two members with surfaces to shape the first and the second sides of the sheet. For optical applications, such as lenses, glass also provides a smooth finished surface suitable for such ophthalmic applications. According to the present invention, the cell cast or RIM mold is provided with a facing surface which includes a metal oxide. As previously mentioned, the metal oxide can be deposited onto a mold or alternatively the mold can be made of a metal which forms the metal oxide on exposure to the atmosphere or an oxidizing treatment such as O 2 plasma. Referring now to FIGS. 4 and 5, a first actual embodiment of a mold used in cell casting is illustrated. A mold  200 is constructed from a planar first 202 and second 206 glass members separated by a gasket 204. In the actual embodiment, the cell cast mold includes two plates of float glass 202, 206 each member being coated at least on the one facing surface with a thin metal oxide 208, 210. The plate members 202, 206 are separated by a rubber gasket 204. The gasket 204 is placed in between the facing surfaces of the first mold member 202 and the second mold member 206 in a manner so as to leave an opening 220 in the mold 200. The opening 220 is used to pour the resin composition in the mold 200. The gasket 204 forms a seal on three sides between the rectangular plate members 202, 206. A spacer placed around the perimeter of the gasket (not shown in the figure) determines the thickness of the molded casting. A second mold member 206 is laid next to the rubber gasket 204, opposite of the first mold member 202, such that the inner facing surfaces 208, 210 of the plate members 202, 206 contain the metal oxide coating. The plates 202, 206 are held together with compressive binder clips (not shown). However, any other suitable fastener can be used. FIG. 6 shows a schematic illustration of a second actual embodiment of a mold according to the present invention for casting ophthalmic lenses. The mold  300 includes a first 302 and a second 304 member having face surfaces 310, 312 coated with a thin metal oxide layer. The members are fabricated from precision ground-to-shape glass substrates. The first member 302 includes an inner 310 (face) surface and outer 314 (air) surface, wherein the inner surface 310 is concave. The second member 304 includes an inner 312 and outer 316 surface, wherein the inner surface 312 is opposite of the concave surface 310. The second member inner surface 312 is planar. The inner surfaces 310, 312 of the first 302 and the second 304 member are coated with a metal oxide. The first member 302 is separated from the second member by a gasket 306, 308 at the first upper edge and a second lower edge, respectively. While a concave surface has been shown, other molds may include one or more flat, concave or convex surfaces as required of the particular manufactured good. Articles produced by cell casting include not only ophthalmic structures, such as eye lenses, but also articles used in optical applications such as windows, filters, displays and microreplicated structures. Reaction injection molding is used to form many commonly used plastic articles in mass quantities, such as automotive components including but not limited to body panels. In another actual embodiment of the invention, plano plastic filters (windows) are cell cast between two tempered sheets of float glass according to the invention. Applications for plastic filters include, among others, electroluminescent and liquid crystal displays (LCD's). The mold configuration is schematically illustrated in FIGS. 4 and 5, and has been described above. A spacer and gasket forms an empty cell (or cavity) between two sheets of tempered glass. An alumina (Al 2O3) film has been formed on both of the inner facing glass surfaces that form the walls of the cavity. The alumina coating is then treated with a mold release agent by the methods described above. An uncured polymerizable resin is then poured into the mold or cavity, and thereafter cured under conventional methods of curing such as UV radiation, or by thermal means. The cured resin is then separated from the mold. A resin article fabricated according to the present invention provides for precise copying of the mold surfaces (also called high fidelity replication), and easy release without residue or contaminants on the resin surface. Therefore, the filters and displays made according to the invention have less surface defects than conventionally manufactured filters and windows, thus, leading to enhanced optical qualities such as transmittance and clarity. By using the process of the present invention, expensive post casting polishing processes are avoided. Molds for refractive structures are generally produced by precision diamond machining. These members are fabricated and used to produce Fresnel lenses, tilting optics, beam diffusing optics and total internal reflectance (TIR) optics. U.S. Pat. No. 6,100,952, assigned to Korry Electronics Co., of Seattle, Wash., describes the latter structures and is herein incorporated by reference. This patent demonstrates an example of TIR optics application used with active matrix LCD's (AMLCD's). FIG. 7 shows the details of the surface structure  216 used to replicate the TIR optical plastic component. FIG. 7 shows an actual embodiment of a cast insert surface 216 with triangular prismatic surfaces. Reference numeral 222 indicates the distance separating peaks while reference numeral 218 represents the scale of the structure portion. The distance 222 can be in the range of about 10 to about 300 microns. The process according to the present invention treats the refractive structure surface 216. A thin metal oxide coating is applied over the diamond machined surface member 216 by any suitable thin-film deposition or surface modification process such as CVD or PVD method. The coated member 216 can then be used as a mold surface with either external mold releases (e.g., dipping in a vat of release agent) or with internal mold releases. The resulting castings have less surface defects than conventionally manufactured structures, thus leading to improved optical characteristics. Molds for diffractive structures are generally produced by photolithography techniques. These structures are fabricated and used to produce gratings, optical recording media, and antireflective motheye structures. FIG. 8 shows an actual embodiment of a diffractive structure mold particularly suitable for this process. The motheye structure is analogous to an acoustic dampening (noise reduction) surface structure. The motheye surface includes an array of conical protrusions  217 spaced about 200 nm apart. Such structures impart an optical anti-reflecting property that reduces the specular reflection of light from a plastic surface from about 4% to less than about 1%. FIG. 8 shows the details of the surface structure used to replicate an anti-reflecting motheye structure. The process according to the present invention treats the diffractive structure surface. A thin film of metal oxide is applied over the motheye surface by any suitable thin-film deposition or surface modification process such as CVD or PVD method. The coated motheye surface member can then be used as a mold surface with the external mold releases (e.g., dipping the mold in a vat of release agent) or with internal mold releases. The resulting casting has less surface defects than conventionally manufactured structures leading to improved optical characteristics. In addition, motheye engineered surfaces add a significant non- recurring cost to the casting mold. Poor release properties often result in breakage of these expensive mold features. The improved release realized by the present invention prolongs the life of expensive mold substrates. While not intending to be bound to any particular theory, the inventors believe that the improved release properties of the release agent are due to ionization chemistry occurring at the metal oxide/metal hydoxyl surface when in contact with an aqueous solution or a polar solution. FIG. 9 illustrates the surface of a conventional silica glass mold  400 and FIG. 10 illustrates the silica mold 404 having a metal oxide surface 402. It is seen that both surfaces 400 and 402 have a propensity to form hydroxyl groups at the surface. The differences lie with the surface chemistry that occurs when different metal oxides are exposed to a polar solvents such as an aqueous solution or polar solution (e.g., polyol enriched pre-polymers). For a given metal oxide or ceramic metal oxide exposed to an aqueous solution, there will be a surface charge associated with the metal oxide that will depend upon the pH of the solution. Thus, under the appropriate circumstances, the surface of silica can be positively or negatively charged. For example, silica will exhibit a positive charge when exposed to highly acidic solutions (pH less than 2). However, when exposed to less acidic solutions (pH greater than 2) the silica surface exhibits a negative charge. For the most part, the surface of silica will exhibit a negative charge because only the most acidic conditions can produce a positive charge. On the other hand, the alumina coating of FIG. 10 exhibits a positively charged surface when exposed to solutions having a pH of less than about 8, meaning that for all acidic and even mildly basic solutions, the surface of the alumina will be positively charged. The positively charged surface is highly attractive to negatively charged anionic surfactants. Similarly, when the metal oxide is exposed to a nonaqueous polar solution (for example a polyol-enriched pre-polymer) a predictable surface charge can be produced on the mold face by adding acidic or basic materials to the solution (pre-polymer). For a more in depth treatment of the subject concerning acid and base chemistry with metal oxide surfaces, the reader is encouraged to refer to Surfactant Science Series Vol 49, Wettability, John C. Berg, and Polymer Interface and Adhesion, Souheng Wu, both of which are herein incorporated by reference. By way of comparison pure silica has a positive surface charge when exposed to an acidic solution with a pH below than 2, while alumina has a positive surface charge when exposed to a solution with a pH below 8. In presently used fabricating methods which use mildly acidic release agents (such as an anionic surfactant) and non-metallized silica glass molds, the negative charged base conjugate of the release agent will not form a durable bond with the negatively charged silica surface. As a result, a barrier release film will not form between the resin and the silica substrate, hence the resin can form an undesirable adhesive bond with the silica and release will not occur. In sharp contrast, the mildly acidic anionic release agent will be highly attracted to the positively charged alumina surface resulting in the spontaneous formation of a release film that will impede adhesion between the resin and the alumina surface. In the polymerization reaction of an isocyanate and a polyol, the isocyanate  406 can react with the hydroxyl groups on the mold surface rather than the polyol, as shown in FIG. 11. Thermosetting resins can adhere to the silica mold surface as a result of this reaction between the isocyanate and the mold surface hydroxyl groups. Hence, the inventors of the present invention believe to have discovered the source of the problem why resin compositions adhere to molds, particularly where the resin includes an isocyanate and the mold is constructed from silica glass. However, isocyanates are not the only molecules to adhere to silica molds. The present invention can be used for any polymerizable composition that has reactive groups with an affinity for hydroxyl groups. The inventors propose a novel solution to the problem. According to the present invention, in the case of mildly acidic release agents, a positively charged mold surface created by compounds with relatively higher IEP's than silica is desirable because a large number of mildly acidic and ionic materials with good release features are commercially available. It is well understood in the literature that metal oxides with higher IEP values exhibit a positively charged surface over a wider pH range than metal oxides with lower IEP's. According to the present invention, an anionic or conjugate base of an acidic release agent could preferentially attach to a positively charged mold surface created by a metal oxide with a relatively higher IEP than silica, thus placing a barrier between the silica and the monomer reactive groups. Alternatively, if a suitable conjugate acid or basic release agent is available, it could preferentially attach to a negatively charged mold surface, such as silica. Therefore, according to the invention to preferentially attach an acidic or an anionic release agent to the surface of a mold, the pH of the solution must be adjusted to a value below the IEP value of the particular mold surface. This is represented graphically in FIG. 12, showing a phosphonic acid compound  408 preferentially attached to the metal oxide coating 402. FIG. 13 shows a mold member including a glass substrate 502 having a metal-oxide coating 504. A release agent with a polar region 506 bonds to the metal oxide surface 508 providing a barrier between the glass substrate 502 and a resin (not shown). If the surface exhibits a high IEP (greater than 7), then it is much easier to find a conventional mildly acidic release agent for that surface. A suitable mold surface for mildly acidic release agents has been found to be metal oxides, and in particular, alumina. Therefore, according to the invention, a solution consisting of an suitable acidic or anionic release agent must exhibit a pH lower than the IEP of the metal oxide coating. Alternatively, for a basic or acid conjugate of a release agent, a negatively charged mold surface is desirable and a metal oxide with a low IEP is desirable. In yet another actual embodiment of the present invention, float glass is used with an external release agent. Float glass is made by a process wherein the molten glass is allowed to float on a liquid pool of tin. As a result, one side of the glass has a tin enriched surface as opposed to the air-side of that same piece of glass. The air-side of float glass is mainly SiO2 (up to 73% by wt). Small amounts of network modifiers such as NaO2, CaO and MgO are also found at the air-side surface of float glass. While the network modifiers and the SiO2 components impart an amphoteric (having cationic and anionic charge on the surface) nature to the substrate, the main constituent SiO2 demonstrates a low IEP value of about 2. It is the inventors' belief that anionic mold releases fail against the air-side of float glass because of poor adhesion properties between the mold release and the low IEP surface. In contrast, the tin side of float glass is enriched with SnO 2. X-ray Photoelectric Spectroscopy (XPS) studies have shown as much as 39% SnO2 at the surface of the tin-side of float glass. See Baitinger, William, et al., Journal of Non-Crystalline Solids, 38 & 39 (1980) 749-754, which is herein incorporated by reference. The isoelectric point of tin-oxide is about 6. Thus the tin-side of float glass demonstrates acceptable release properties for polyurethane when coupled with anionic external mold release agents. The discovery of anionic external mold releases (EMRs) used in conjunction with SnO 2 coatings has significant economic implications. Metal-oxide films are generally custom applied to the substrate by various batch coating techniques (PVD, CVD, sol-gel). The deposition process increases the cost of glass molds. However, tin-oxide is inherent to one side of standard float glass, hence the metal-oxide coating adds no cost to the mold. Furthermore, architectural glass, such as SUNGATE® Low E coated glass by PPG, is produced on a large commercial scale with CVD deposited tin-oxide films applied to the air-side of float glass. Both the tin-side float glass and SnO2 coated architectural glass are economical sources of substrates ready to be used with the disclosed process. A suitable metal oxide coating used in the present invention includes a metal oxide or ceramic oxide compound exhibiting an isoelectric point such that the ionic conjugate of suitable mold releases are preferentially oppositely charged. The term metal oxide is intended to refer to the higher and lower valent oxides of a metal where more than one valance state exists. A suitable metal oxide coating preferably exhibits an IEP of greater than 2. More preferably, the metal oxide coating exhibits an IEP of greater than or equal to about 4. For example, TiO 2 exhibits an IEP of about 4. While TiO2 is a suitable coating, other oxides of Ti are also suitable, such as TiO, Ti2O3, and Ti3O5. Still more preferably, the metal oxide coating of the present invention exhibits an IEP of greater than or about equal to 8. A suitable metal oxide coating exhibiting an IEP of about 8 is alumina, Al2O3. Besides alumina, the oxides Al2O and AlO are also suitable. Other suitable metal oxide compounds include oxides of zirconium, such as ZrO2, tantalum, Ta2O5, hafnium, HfO2, yttrium Y2O3, niobium, Nb2O4 and Nb2O5, Nickel, NiO, magnesium, MgO and MgO2, iron, Fe2O3, Fe3O4, FeOOH, and Fe(OH)2, and chromium Cr2O3, CrO2, and CrO3. Iron oxides have an isoelectric point in the range of about 7 to about 12.5 depending on the oxidation state, making iron oxides suitable coatings in the present invention. Chromium oxides have an isoelectric point in the range of about 6 to about 7. NiO exhibits an IEP of about 10. MgO exhibits an IEP of about 12. The isoelectric point can be in the range of about 2 to 12. In addition, any combination of two or more of any of the aforementioned metal oxides (e.g. Al2O3—MgO) are also suitable coating materials. While this list is not exhaustive, other metal oxides exhibiting a surface charge opposite of the release agent charge can be selected. While the IEP is not the sole determining factor in choosing a metal oxide coating, the inventors have discovered that alumina performs well, is easily deposited on a substrate, and is durable to withstand repeated cycling as well as being commercially viable. wherein Y is any element or combination of elements that forms an acid conjugate upon dissociation such as H, NH 4, NR4 (where R is an alkyl chain such as methyl, ethyl, propyl, and butyl or an aromatic group.) or Na. Y is preferably hydrogen. 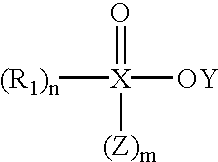 X is any element that facilitates the dissociation and formation of a base conjugate with reduced chemical interaction with the polymer resin. Examples of X are P, S, and C, where P is preferred. R1 is any combination of elements that facilitates solubility within the polymer resin and also provides a non-reactive barrier film suitable for providing release properties. Examples of R1 include alkyl, fluorinated alkyl, alkyl ester and fluorinated alkyl esters with chain lengths between 8 to 20 carbon units. The integer n is between 1 and 2, wherein n is 1 for carboxylic acid, sulfonic acid, phosphonic acid, and di-acid phosphate esters. The integer n is 2 for phosphonic acid and mono-acid phosphate esters. Alternatively, R1 can be alkylaryl or polyether derivatives. Z is either oxygen as with sulfonic acids or —OH as with di-acid phosphate esters or phosphonic acids. For such compounds, m is an integer equal to 1. For all other materials such as carboxylic acid, mono-acid phosphates and phosphonic acid, m is equal to 0. A suitable release compound is perfluorododecanoic acid or octylphosphonic acid or any combination thereof. Exemplary compounds useful as release agents in the present invention are sold under the trade names Zelec® MR-1 obtained from the Stepan Company of Northfield, Ill., Zonyl® UR obtained from the DuPont Company of Wilmington, Del., and Fluowet® PL80 obtained from the Clariant Company of Muttenz, Switzerland. FIGS. 14 and 15 show the mold and pull-force testing configuration  600. The mold cavity includes an untreated float glass substrate 604 (top glass in FIG. 14) and a surface treated float glass substrate 610 (bottom glass in FIG. 14). A bolt 602 was fastened to the side opposite of the casting on the untreated glass substrate 604. This bolt 602 is attached to the Instron test fixture (not shown) for pull-force measurements. The bottom glass 610 is treated by various methods as described in the forthcoming experimental example section. The bottom glass 610 is held in position with clamps 614 and 616, while top glass 604 is pulled in the direction of arrow 618. A urethane resin mixture  608 (described in the example section) is poured between the two glass substrates and cured. A pull-force test is then performed on the mold assembly/cured resin to pull float glass substrate 604 in a direction indicated by arrow 618. This test configuration allows the resin to preferentially adhere to the untreated glass substrate surface 606. Therefore, the pull-force test measures the release properties of the interface between the urethane resin 608 and the bottom treated glass surface 612 as shown in FIG. 15. Apply 0.5 microns of Al 2O3 film to a heated float glass substrate by PVD (Physical Vapor Deposition). Assemble the test mold as shown in FIG. 14. The alumina coated glass substrate is the treated (bottom) mold surface 612 shown in FIG. 14. Apply 0.5 microns of Al 2O3 film to a heated float glass substrate by PVD. Soak the Al2O3 treated mold face in a solution of 0.4% by weight Zonyl UR (a fluorinated phosphate ester mixture from the DuPont Company) dissolved in a 60/40 dionized (DI) water/isopropanol mixture for 30 minutes. Briefly rinse the residual Zonyl UR solution from the treated glass with tap water and dry. Assemble the test mold as shown in FIG. 14. The Zonyl UR/alumina coated glass substrate is the treated mold surface 612 shown in FIG. 14. Assemble a mold using untreated float glass as the bottom mold surface  612 shown in FIG. 14. Apply 0.5 microns of Al 2O3 film to a heated float glass substrate by PVD. Assemble the test mold as shown in FIG. 14. The alumina coated glass substrate is the treated mold surface 612 shown in FIG. 14. The resulting casting failed to release from the Al 2O3 coated glass. Apply 0.5 microns of Al 2O3 film to a heated float glass substrate by PVD. Soak the treated mold in a solution of 0.5% by weight perfluorododecanoic acid dissolved in a 50/30/20 DI water/2-butanone/acetone mixture for 1 hour and 30 minutes. Briefly rinse the residual solution from the treated glass with tap water and dry. Assemble the test mold as shown in FIG. 14. The fluorinated acid/alumina coated glass substrate is the treated mold surface 612 shown in FIG. 14. Apply 0.2 microns of TiO 2 (Isoelectric Point=4.0) film to float glass by PVD evaporation method. Charge a flask with 22.2 g of isophorone diisocyanate (IPDI), 20 g of polycaprolactone triol (average MW=300 g/mol) and 0.22 g of ZELEC MR-1. Mix and heat the mixture to 60° C. until obtaining a homogenous/clear solution. Cast the clear solution onto the TiO 2 coated glass and cure the resin at 160 C for 4 hours. Apply 0.2 microns of SiO 2 (Isoelectric Point=2.0) film to float glass by PVD evaporation method. Charge a flask with 22.2 g of isophorone diisocyanate (IPDI), 20 g of polycaprolactone triol (average MW=300 g/mol) and 0.22 g of ZELEC MR-1. Mix and heat the mixture to 60° C. until obtaining a homogenous/clear solution. Cast the clear solution onto the SiO 2 coated glass and cure the resin at 160° C. for 4 hours. The resulting casting failed to release from the SiO 2 coated glass. Soak float glass substrates in a solution of 0.4% by weight Zonyl UR dissolved in a 60/40 DI water/isopropanol mixture for 30 minutes. Briefly rinse the residual solution from the treated glass with tap water and dry. Assemble the test mold as shown in FIG. 14. The fluorinated phosphate coated air-side of the glass substrate is the treated mold surface  612 shown in FIG. 14. Apply 0.5 microns of Al 2O3 film to a heated float glass substrate by PVD. Soak the Al2O3 treated mold face in a solution of 0.4% by weight Zonyl UR dissolved in a 60/40 DI water/isopropanol mixture for 30 minutes. Briefly rinse the residual Zonyl UR solution from the treated glass with tap water and dry. Assemble the test mold as shown in FIG. 1a. The Zonyl UR/alumina coated glass substrate is the treated mold surface 612 shown in FIG. 14. Apply 0.5 microns of Al 2O3 film to a heated float glass substrate by PVD. Soak the Al2O3 treated mold face in a solution of 0.6% by weight OPA dissolved in a 60/40 DI water/acetone mixture for 30 minutes. Briefly rinse the residual OPA solution from the treated glass with tap water and dry. Assemble the test mold as shown in FIG. 14. The OPA/alumina coated glass substrate is the treated mold surface 612 shown in FIG. 14. Apply 0.5 microns of Al 2O3 film to a heated float glass substrate by PVD. Soak the Al2O3 treated mold face in a solution of 0.6% by weight OPA dissolved in a 60/40 DI water/acetone mixture for 1 hour 30 minutes. Briefly rinse the residual OPA solution from the treated glass with tap water and dry. Assemble the test mold as shown in FIG. 14. The OPA/alumina coated glass substrate is the treated mold surface 612 shown in FIG. 14. Apply 0.5 microns of Al 2O3 film to a heated float glass substrate by PVD. Soak the Al2O3 treated mold face in a solution of 0.6% by weight Fluowet PL80 (perfluorinated alkylphosphonic acid from the Clariant Company) dissolved in a 60/40 DI water/acetone mixture for 30 minutes. Briefly rinse the residual Fluowet solution from the treated glass with tap water and dry. Assemble the test mold as shown in FIG. 14. The Fluowet/alumina coated glass substrate is the treated mold surface 612 shown in FIG. 14. Apply 0.2 microns of TiO 2 (Isoelectric Point=4.0) film to a silica glass microscope slide. Apply a few drops of the above solution to a urethane sheet. Slowly lower the TiO 2 coated slide on top of the drops of resin so as to laminate the coated glass to the plastic substrate. The resin will wet both the plastic and the coated glass under the weight of the microscope slide. Following the cure cycle, the microscope slide releases from the hardened resin leaving a coating adhered to the urethane that replicates the fine surface features of the TiO 2 microscope slide. Soak an untreated mold face in a solution of 0.4% by weight Zonyl UR dissolved in a 60/40 DI water/isopropanol mixture for 30 minutes. Briefly rinse the residual Zonyl UR solution from the treated glass with tap water and dry. Assemble the test mold as shown in FIG. 14. The Zonyl UR/tin-side of uncoated float glass substrate is the treated mold surface  612 shown in FIG. 14. Assemble an untreated test mold as shown in FIG. 14. The tin-side of uncoated float glass substrate is the mold surface  612 shown in FIG. 14.
summarizes the results of the foregoing examples. curing the resin mixture in the mold. 2. The method of claim 1, wherein the mold is a glass substrate comprising silica. 3. The method of claim 1, wherein the metal oxide is selected from the group consisting of transition metal oxides and ceramic oxides. 4. The method of claim 3, wherein the metal oxide is selected from the group consisting of TiO2, TiO, Ti2O3, Ti3O5, SnO, SnO2, Al2O3, Al2O, AlO, ZrO2, Ta2O5, HfO2, Y2O3, Nb2O4, Nb2O5, NiO, MgO, MgO2, Fe2O3, Fe3O4, FeOOH, Fe(OH)2, Cr2O3, CrO2 and CrO3 or any combination thereof. 5. The method of claim 4, wherein the metal oxide is Al2O3. 6. The method of claim 4, wherein the metal oxide is NiO. 7. The method of claim 4, wherein the metal oxide is MgO. 8. The method of claim 4, wherein the metal oxide is SnO2. 9. The method of claim 1, wherein the metal oxide coating is a thin metal oxide layer. 10. The method of claim 9, wherein the metal oxide is deposited on the mold by physical vapor deposition, chemical vapor deposition, or the like. 12. The method of claim 1, wherein the metal oxide coating is formed by O2 plasma or atmospheric oxidation. 13. The method of claim 1, wherein the metal oxide exhibits an isoelectric point greater than about 2. 14. The method of claim 13, wherein the metal oxide exhibits an isoelectric point greater than or about equal to 4. 15. The method of claim 14, wherein the metal oxide exhibits an isoelectric point greater than or about equal to 8. 17. The method of claim 16, wherein the metal oxide exhibits an isoelectric point less than or about equal to 12. 18. The method of claim 1, wherein the metal oxide exhibits an isoelectric point from about 7 to about 12.5. 19. The method of claim 18, wherein the metal oxide is selected from the group consisting of Fe2O3, Fe3O4, FeOOH, and Fe(OH)2 or any combination thereof. 20. The method of claim 1, wherein the metal oxide exhibits an isoelectric point from about 6 to about 7. 21. The method of claim 20, wherein the metal oxide is selected from the group consisting of CrO3, CrO2, and Cr2O3 or any combination thereof. 22. The method of claim 1 wherein the release agent is used as an internal release agent. 23. The method of claim 1, wherein the release agent is an anionic compound. m is either 0 or 1.
m is 0 when X is C or X is P and the compound describes mono-acid phosphates or phosphonic acid. 26. The method of claim 1, wherein the release agent is an ester or acid selected from the group consisting of phosphates, phosphonates, phosphonites, sulfates, sulfites and carboxylates. 27. The method of claim 26, wherein the release agent is selected from the group consisting of monoacid phosphate esters, diacid phosphate esters, fluorinated monoacid phosphate esters, fluorinated diacid phosphate esters, perfluorododecanoic acid, octyl phosphonic acid, and perfluorinated alkyl phosphonic acid. 28. The method of claim 1, wherein the release agent is used as an external release agent. 29. The method of claim 1, wherein the resin mixture comprises an epoxy or an isocyanate. 30. The method of claim 1, wherein the resin mixture comprises a compound selected from the group consisting of isophorone diisocyanate, 1,6-hexamethylene diisocyanate, xylylene diisocyanate, bis (4-isocyanatocyclohexyl) methane, cyclohexane diisocyanates, toluene diisocyanate, tetramethylxylyene diisocyanate methylene bis(cyclohexylisocyanate), bis 3,4 epoxy cyclohexylmethyl adipate, 3,4 epoxy cyclohexylmethyl-3′-cyclohexenylmethyl adipate and diallyl diglycol carbonate. 31. A plastic ophthalmic lens made by the method of claim 1. 32. A plastic optical filter made by the method of claim 1. 33. An optically engineered surface structure made by the method of claim 1. 34. The structure of claim 33 wherein the structure includes a refractive surface. 35. The structure of claim 33 wherein the structure includes a diffractive surface. 36. The structure of claim 33 wherein the structure includes a stochastic surface. 37. A reaction injection molding made by the method of claim 1.
providing an anionic release agent externally to the SnO2 surface of the float glass. providing a mold formed from the float glass. providing a urethane resin in the mold and curing the resin. providing an epoxy resin in the mold and curing the resin. a washer apparatus for removing excess mold release from the metal oxide surface. a gasket for separating the first and second member in spaced apart relationship to define a cavity bounded by the first and second member and the gasket.